For Ana Villegas, the importance of empowering young Latinas is personal. When she was growing up in Peru, Villegas’s family expected her to become a stay-at-home mother like her own mother was. Villegas, however, had different plans. After completing a master’s degree in finance and marketing and building her career in Peru, she applied for an MBA at Kellogg School of Management at Northwestern University. “I moved to this country with my two suitcases and $2,000 in my savings account,” she says. Now, Villegas is marketing director for North America commercial business at Dell Inc., where she is responsible for B2B marketing communications. Villegas has led the evolution of the marketing efforts through digital and next-gen technology adoption, establishing forums to drive innovation and partnering with key vendors to be first in market for new marketing tactics. Villegas also speaks at B2B marketing forums, where she discusses digital evolution, omnichannel strategy, and how to succeed in a shifting landscape. Villegas’s work at Dell Inc. goes beyond marketing, however. 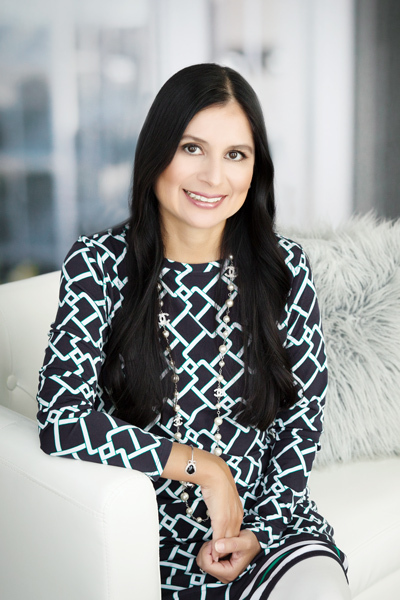 Soon after joining the company in 2003, Villegas joined the employee resource group (ERG) Latino Connection, formerly known as Adelante. She attended events and independently mentored Latina employees until 2014, when members of Latino Connection’s board asked her to join the ERG as an emerging leader. Some students were amazed to see employees who looked like them. “They would say, ‘I didn’t know people like me worked here,’” Villegas remembers. This bittersweet feedback underscored the need for a program like Latinitas. Villegas herself is a model of what the Latinitas mentees can achieve. Among her recent accomplishments is the Dell B2B digital campaign, which won Best B2B Campaign in the 2017 DMN Awards, a showcase of the most innovative campaigns, technology, and personalities in marketing. The campaign used dynamic optimization to create a customer-driven advertising journey. In one example, a banner advertisement shows four Dell solutions, and a consumer can click on one to receive more information. When a consumer returns to the website, the advertisement remembers where they were in the journey and presents the next choice. Less than 30 percent of consumers visit Dell’s website before they are ready to buy a product, making third-party engagements like this one vital. “We could keep optimizing the Dell site forever,” Villegas says. “But that was only allowing us to keep customers, not to gain or grow customers.” The Dell B2B digital campaign guided potential customers through the journey of choosing Dell and sent them to the website only after several levels of off-site engagement. The campaign achieved thirteen times the engagements over previous campaigns with a fourth of the cost. Working in technology opens up options beyond the tech industry, Villegas says. Five years ago, her main concern when hiring new talent was creativity. Now, she looks for individuals who understand technology. “More and more, technology is becoming this fiber that goes across the functions,” she says. In June 2017, Villegas was honored at the Latinitas Quinceañera gala. The event featured artists from around Austin, a silent and a live auction, and recognition of Villegas and other Latinitas supporters. Latino Connection is expanding its reach by partnering with other technology organizations in Austin to form a cross-company group called Latin@s in Tech. The group hosted a career development event in September 2017, during Hispanic Heritage month. Latinitas will be in attendance with information about ways to support the organization. “I’m very proud that Latinitas is part of this, and that we will all be supporting Latinitas,” Villegas says.